If you’re in need of a super quick and easy dinner recipe, you’re going to fall in love with these 5 ingredient slow cooker pork “carnitas” tacos. This recipe takes all of 5 minutes to prep, and the tacos take 5 minutes to assemble. The end result is incredibly tasty slow cooker tacos! Happy Cinco de Mayo everyone! I thought it only fitting that since today is Cinco de Mayo, and Five-Ingredient Fridays, I share a 5-ingredient taco recipe. 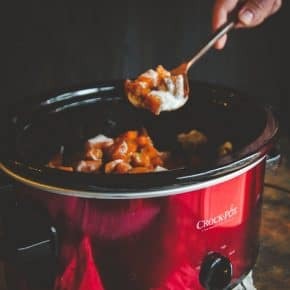 This recipe is a take on one of my favorite crockpot recipes: 3 ingredient pulled pork and is even included in my cookbook!! A pork shoulder is slow cooked to perfection in a crockpot with soda, and that’s it! 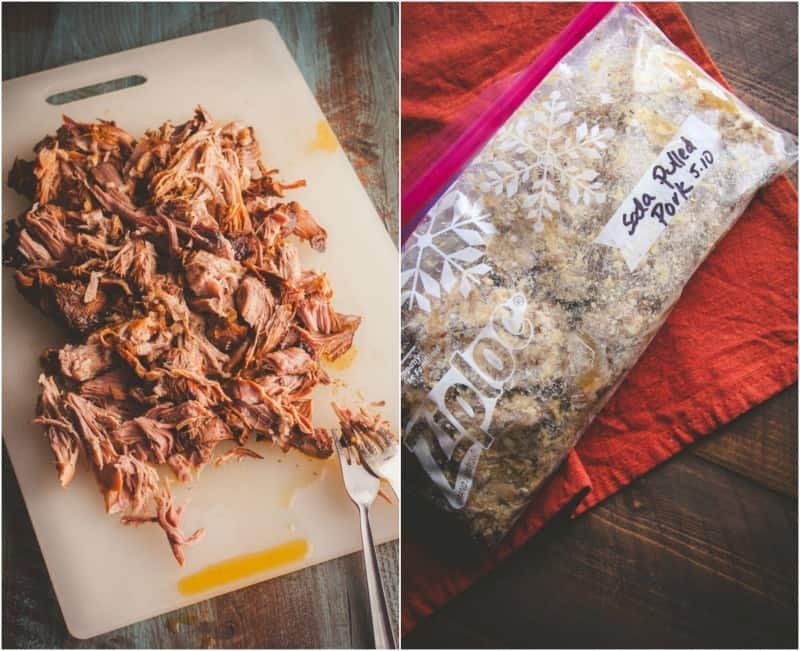 The end result is a juicy and delicious pulled pork, that goes perfectly in tacos to create pork carnitas tacos, seriously, you have to try it, you’ll be amazed! 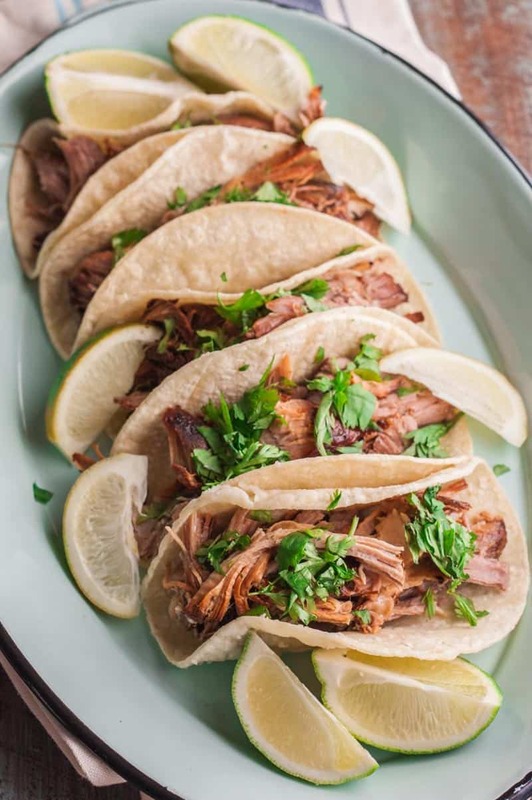 The pulled pork freezes so well too, so if you make a pork shoulder, you can freeze the shredded pork and then reheat it to make these tacos, or it goes really well on sandwiches with some BBQ sauce or even as a nacho topping for the best nachos ever. Seeing as how I love alliterations, especially those involving food (taco Tuesdays, Five-Ingredient Fridays) it’s no surprise that I love these tacos and tend to enjoy them on Tuesdays and Fridays (Taco Tuesdays, Fiesta Fridays or Five-Ingredient Fridays apply in the latter case). My hubby and I love having Mexican food with friends on Fridays and calling it Fiesta Friday lol. 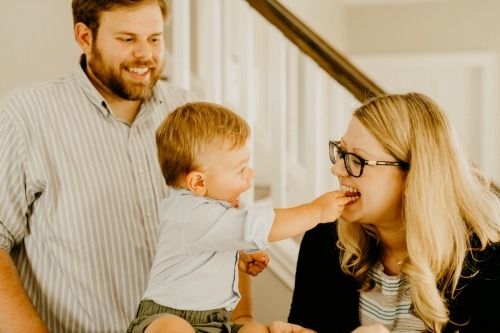 I mean, who doesn’t want to get together for Fiesta Friday? You could also make a margarita bar or non alcoholic aqua frescas and this 5 ingredient quick guacamole (my fave-I make it all the time!!) and life would be complete. 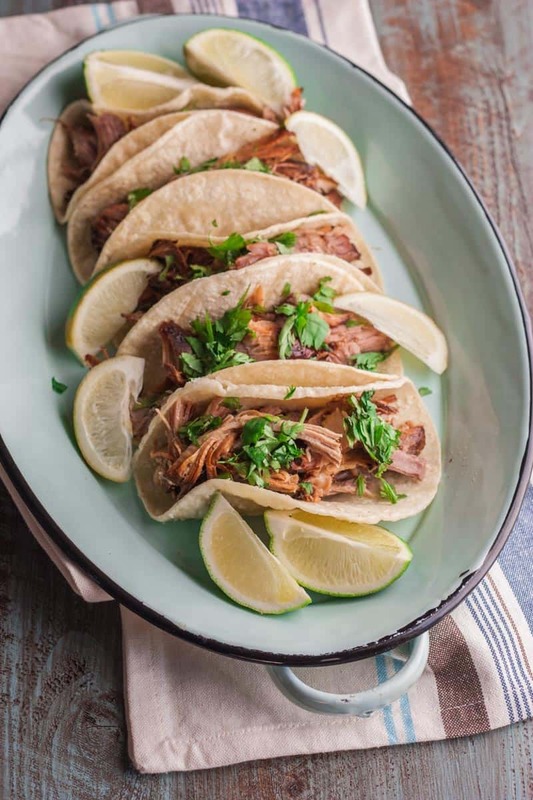 These tacos are super simple and super flavorful: juicy pulled pork is topped with cilantro and lime and then served in tortillas; it makes for one delicious dinner!! How are you celebrating Cinco de Mayo this year? Place the pork shoulder, fat side down, in a slow cooker. Sprinkle with the salt and pepper. Pour the soda over the pork. Cover the slow cooker and set on low. Cook for 8 hours, then transfer the pork to a shallow bowl or cutting board with a lip and, using two forks, shred it. Preheat the oven to 350°F. Place the tortillas on a baking sheet and bake for 3 to 5 minutes, or until the edges start to curl up. Remove from the oven and set on a plate. Put the shredded pork, cilantro, and lime wedges in individual bowls for taco assembly. To assemble the tacos, put a few forkfuls of pork into a tortilla shell, add a pinch of cilantro, and squeeze some lime juice on top. Repeat until all the tacos are assembled, then serve and enjoy. This recipe is easily scaled down: Simply make as many tacos as desired and save the remaining pork and tacos for leftovers. 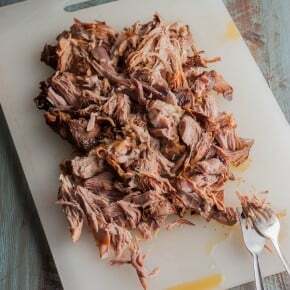 If you have leftover shredded pork, it stores really well: place the shredded pork in an airtight container and pour some juices from the slow cooker over the meat. 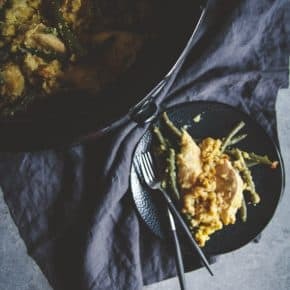 This pork freezes and reheats very well. To freeze, place the shredded pork in a resealable plastic freezer bag and label with the date when it was made. Perfect for Cinco de Mayo! Thank you my friend!!!! hey girl- these tacos look so yummy! Y’all have a great weekend! Did you use coca cola soda?